Two years on from first publication of The Fast Diet, which outlined a radical new approach to weight loss, intermittent fasting and the 5:2 programme is still the diet everyone is talking about. In this fully updated and expanded edition for 2015, Dr Michael Mosley and Mimi Spen... read full description below. Is it possible to eat well, most of the time, and get slimmer and healthier as you do it? With the Fast Diet it is. Dr Mosley's Fast Diet has become the health phenomenon of our times. And for good reason. This radical approach to weight loss really is as simple as it sounds. You eat normally for five days a week, then for just two days you cut your calorie intake (600 for men, 500 for women). In this fully revised edition, Michael Mosley introduces the science behind the diet, with exciting new research into the wider health benefits of intermittent fasting including studies on asthma, eczema and diabetes. Mimi Spencer, award-winning food and fashion writer, then explains how to incorporate fasting into your daily life, with a wealth of new detail on the psychology of successful dieting. She presents a range of enticing new recipes, along with an easy Fast Diet shopping list and a user-friendly calorie counter to help you sail through your Fast Days. 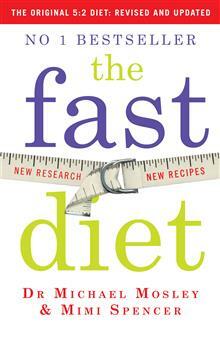 Whether you're a committed faster or a new recruit to the Fast Diet, this revised edition is a must. Dr Michael Mosley is a British journalist, scientist, producer and TV presenter. Prof Roy Taylor is Professor of Medicine and Metabolism at Newcastle University. Mimi Spencer has written about body shape, diet and food trends in national newspapers and magazines for more than 20 years. She co-authored The Fast Diet (Short Books, 2013) with Dr Michael Mosley and wrote The Fast Diet Recipe Book (Short Books, 2013) and Fast Cook (Short Books, 2014).